Handy Hints for Raising Ducklings! 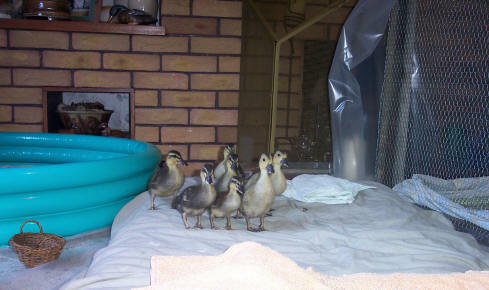 This page is designed to help anyone raising ducklings for the first time. It contains all the little bits of information that are hard to find when you start out; things we wish we'd known at the beginning! Ducklings resting on my stomach! If you have your own breeding ducks but plan to incubate the eggs artificially, collect the eggs daily to ensure they are as clean as possible. Most breeders avoid washing eggs and advise you to only incubate clean ones but I must admit that some of our little ones came from muddy eggs! Accuracy of thermometers is difficult to check. Checking with another thermometer almost never helps as they vary so much. Many breeders say the only real way to determine the correct setting for your incubator is to have a successful hatch and keep using the same setting! Not much comfort when you are starting out. All you can do is set to the recommended temperature and try it. After our first hatch, where only Sheldon survived, we upped the temperature by two degrees (as her late hatch date indicated it had been too cool) and had 7 of our 12 eggs hatch the next time- so don't give up! Eggs need to be turned. You may have an incubator which turns them automatically but, if not, turn them an odd number of times daily. Three times is often recommended. Some breeders don't think automatic egg turning machines are a good idea for duck eggs, but my crew hatched fine with automatic turning and one manual turn each night...since that was what I thought I should do at the time. STOP TURNING THE EGGS 2 or 3 DAYS BEFORE HATCH IS DUE! Humidity is an important aspect of hatching duck eggs. Our incubator has two in built pans to add water to. We kept the water in one pan topped up during the whole incubation period and then, when the first egg pipped added warm water to both pans to raise the humidity. (Ducks getting back onto the nest wet from the pond has a similar effect in natural hatching!) Other people spray the eggs with water when they turn them (perhaps more necessary if you are having to open the incubator three times or so each day to turn manually). I read so much about humidity measuring, how to plot charts and graphs and create a wet thermometer etc that I nearly didn't try to hatch at all as it sounded so difficult. In the end, though, we just kept an eye on the development of the air pocket- which should occupy between a quarter and a third of the egg at the time of hatching- and followed the above suggestions for the water pans (from our incubator manual) and their air sacs seemed to develop well. Remember, however, to be sensible about where you locate the incubator. A room with a stable temperature and humidity is best i.e. not a kitchen or laundry room that will have extremes of either. I kept the central heating off in the room we used so that it didn't vary too much when heating went off at night and make the incubator work too hard. Excessive humidity can cause problems, as can lack of humidity but, from my experience, I would say don't be frightened by the technical jargon surrounding this aspect of the hatch. Of course, you need to bear in mind your climate and may need to research this further if you intend to hatch large numbers of birds. Eggs can be checked after about a week, by a process called candling, to see if they are fertile. After that, check each week and remove any "bad" eggs. Click here to find out more about candling! The most important thing to remember is not to interfere any more than absolutely necessary with the hatch. KEEP THE LID ON! The first stage of the hatch itself is when the duckling pushes its beak through the membrane into the air sac at one end of the egg (a process called internal pipping). At this point you can hear the ducklings tapping on the shells and cheeping. The next stage (up to two days later) is the external pip when they make the first tiny crack in the shell. It just looks like a little bump but gives them the air they need to continue. Finally (again, up to one or two days later) the duckling pushes its beak through the shell breaking it and then wriggling round to break the next section until the end of the egg opens enough for it to be free! We have Call ducks (who are notoriously bad at breaking through the shell) and did, with the advice of an expert, help some of our ducklings, using tweezers to make a tiny hole in the shell next to the air sac. They are now fully grown, happy ducks! It must be emphasized, though, that it is a risky process and if you decide to help them with the external pip, you must be ready to keep an eye on them after that as they may need more help due to the loss of humidity. If the membrane dries out too much, they can get trapped. (Use warm water in a sprayer to add a little moisture to the egg if you need to lift it out of the incubator once there is a hole in the shell.) Remember, with a normal hatch, there may be a few days between the internal pip and hatch so don't be too impatient. Do your research, ask questions and be sure you know what you are doing before trying to help them! The main thing to remember is that you MUST allow the duckling to get out of the egg itself. It may remain in the shell, with it partly open, for a day or so while it completes the absorption of the yolk! Click here to follow our second hatch! 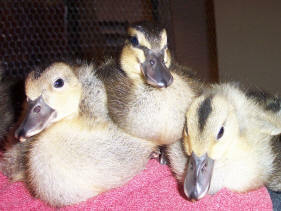 Ducklings should remain in the incubator for around twelve hours after hatching to dry out fully. Another advantage of leaving the lid alone at this stage is that you will not be reducing the humidity and so disturbing the hatch of any other ducklings. Also, and this has to be seen to be believed, the ducklings actually encourage and even appear to help the others with the hatch! 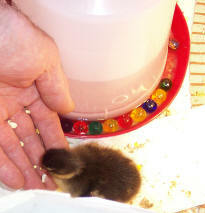 After the twelve hours in the incubator, move ducklings to a brooder. The brooding box/ pen needs a heat lamp. 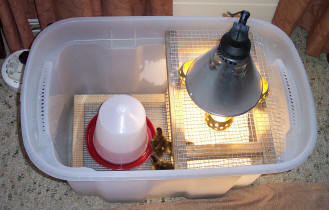 An ordinary 100 watt bulb in a metal brooding lamp was enough for our ducklings. We raised it higher as they got too hot under it and then reduced it to a 60 watt one the next week. (Just keep an eye on them. If they move to the edge of the enclosure it may be too hot and if they huddle together tightly under the lamp, they may need more heat.) In week three they shouldn't need heat if they are kept indoors. Our second hatch only had heat until the end of week two however, our solo duckling (from the first hatch) had it for an extra three or four days. When she stopped sleeping under it, I knew it was time to take it away. Our crew moved to a larger pen later, when the heat lamp was no longer needed. Excuse the indelicate nature of this one but...I feel I should point out that the ducklings' "poop" is a greenish colour at first. This is normal. Also, another panic moment for us was when our first duckling had clear liquid coming from her nostrils. It seems that this is either due to over excitement or over eating/ drinking. Let the duckling rest and it should be fine! It is important not to let the duckling(s) follow anyone for the first three days. In fact, the best advice is to avoid handling them more than is necessary for these few days as they can imprint too heavily on you, which can create difficulties later on. Once the duckling goes into the brooder, it needs water in a drinker (which is deep enough for it to submerge its beak (to clear its nostrils) but not deep enough for it to get its whole head in at that stage so it won't drown. Marbles can be used in the bottom to make a deeper / bigger container safe). It doesn't need food for the first 24 hours after hatching as this gives it the chance to use the nutrients absorbed from the yolk when it was in its shell. After that it has crumbed food (starter crumbs) which you can get from an agricultural supplies shop. Ducklings need food and drink available at all times while they are growing. This winter, I have followed the advice of the UK Call Duck Association and fed my adults wheat under water during the day which has solved the problem of pellets going soggy in all our British rain! Follow their link for more feeding advice. Ducklings can have supervised swimming from as early as day 1. With our first duckling, we were cautious and didn't give her water to swim in until day 8. As a result, it took her a long time- and encouragement from her brothers and sisters who hatched weeks later- to become the water baby she is today! The second time round, we introduced the ducklings to water on day four (allowing time for Titchy to get stronger first). These ducklings really did take to it well! Following an excellent suggestion on the Poultry Forum we used a paint roller tray for the first few days swimming. 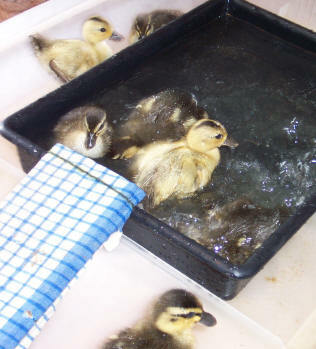 (The paint roller tray has an in-built slope which acts as a duckling ramp and, given access into the tray, they easily jumped out of the "shallow end".) The very first swim only lasted a few minutes and we were careful not to let the ducklings become chilled. As well as making sure they don't get chilled, ensure they have easy access in and out of the water and a warm place to dry off. They shouldn't be away from access to their heat lamp for too long anyway, but be careful as bulbs and wet ducklings could be a nasty mix! As they get bigger, a small amount of water goes a long way, and a baby bath within our bath was ideal to contain our second batch and their splashes by day 10. Of course, in warmer climes, you may be able to do even these early bath times outdoors! Click here to see how our water shy duckling became a water baby! Click here to follow the second hatch's Duckling Antics and watch their swimming tubs grow! Click here to find out how to tell the difference as they grow up! Before getting ducks, you should ensure you can provide suitable housing for them. You need to consider their health, ensuring adequate ventilation, and protection from predators. The ducks must be shut up each night before dark, otherwise you risk them falling prey to foxes. The UK Call Duck Association (Link above) has suggestions for housing as do the sites mentioned below. Take plenty of photos as they grow up incredibly quickly and it is great fun to be able to look back on it! Like us on Facebook or Contact me via email. If you have enjoyed this page, or found it helpful, please consider making a donation, using the PayPal button below, to help with running costs. I'd love to hear about your ducks! Read about Ducky People who have contacted me! Submit your photos for my new Ducks We Know section! 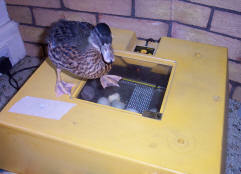 Click here to read Sheldon's daily duckling diary. Click here to read about the seven ducklings in our second hatch and follow their first 8 weeks! Click here to see my artwork, read about my ME journey or view my garden and pet pictures!